Imagine a tropical resort close to the mountains, in a setting that affords the most picturesque views of nature. Imagine taking a dip in the swimming pool and getting a massage right after, savoring a laid-back yet vibrant lifestyle. Imagine living in this place, you and the whole family. Vireya, the first and only tropical resort community in Tagaytay Highlands, offers refreshing views of the Taal Lake and Highlands mountains, well as leisure and relaxation amenities which residents can enjoy. Now stop imagining, as tropical resort living is possible at Vireya, the first and only tropical resort community in Tagaytay Highlands. Situated at the highest point of the Midlands, Vireya offers its residents a perfect blend of the cool mist of the mountains and the warmth of the tropics. Residents enjoy the invigorating mountain air while looking out at the scenic Taal Lake and Mt. Makiling. 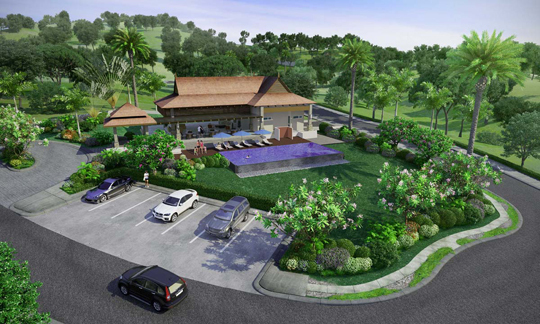 One of the most sought-after developments within the mountain resort complex in Tagaytay, Vireya offers a distinct tropical resort experience to future residents and their families with its latest phase. Future homeowners of Vireya can build tropical-inspired homes on 250- to 562-square-meter lots, where design elements of wood and wide glass windows let the verdant outdoors in. Staying true to its vision of holistic living, the residential property presents diverse points of interests within the community, such as exclusive leisure amenities that promote wellness and adventure right at the resident’s doorstep. Take a refreshing dip at the Pavana’s swimming pool or unwind at the Ammanya Massage Point; go for a relaxing stroll at Vireya’s pocket parks and gardens like the Cala Mira, Leafwing, and Garden Patio; let kids frolic at the very first Treehouse within Tagaytay Highlands; and jump-start an active lifestyle along the jogging path. It even gets better: a property purchase at Vireya comes with access to a wide range of recreational activities at The Country Club. Residents and their guests may try new eco-adventures such as the Aerial Walk, Trail Buggy, Highlands Archery, and Pedal Go Kart Racing as well as other sports facilities for swimming, tennis, bowling, and badminton. Gastronomes will be treated to specialty restaurants like the Highlander Steakhouse, Highlands China Place, and a variety of dining outlets at the Gourmet Avenue. Tagaytay Highlands is the premier mountain resort development of the SM Group in Tagaytay. Call (02) 505-2422 or 0917-5150158 or visit www.tagaytayhighlands.com for inquiries and more details.